Much has been made of the vaunted “back to the city” movement by “the young and restless,” young professionals, the creative class, empty nesters and others were voting with their feet in favor of cities over suburbs. 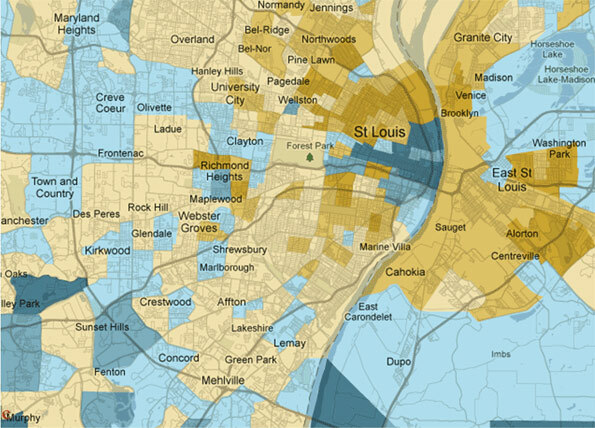 Although there were bright spots, the Census 2010 results show that the trend was very overblown, affecting mostly downtown and near downtown areas, while outlying ones bled population. One culprit for this discrepancy seems to be that the intra-census estimates supplied by the Census Bureau were inflated – in some cases very inflated. One particularly egregious case relates to Atlanta. Its huge projected population increase in the 2000s led me to describe it as “one of America's top urban success stories.” The reality proved to be quite different. Rather than strong population growth in the city, the population growth turned out to be basically flat, quite a different story. Other declines might be more predictable, such as Detroit, or those who had previously challenged estimates like Cincinnati and St. Louis. 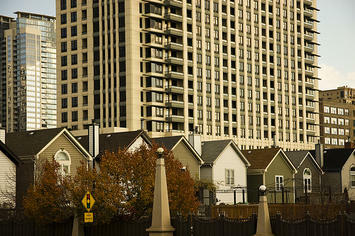 Still, even urban cores in rapidly growing regions like Dallas and Houston were not immune from this trend. There were some exceptions. 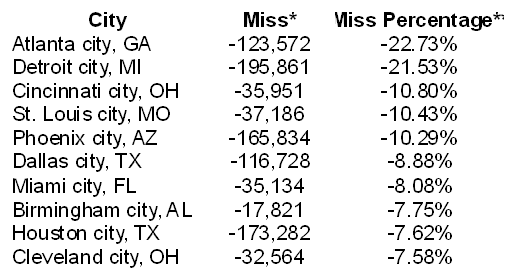 Cities like Indianapolis, Columbus, and Oklahoma City came in slightly ahead of expectations, but the number of cities with misses and the sizes of the positive and negative misses tilted towards the down direction. It seems clear now that the justification for much of the “back to the city” story reflected bad estimates. People can't be faulted for relying on the official government numbers – I did. But the reality of the 2010 Census, as demonstrated by Wendell Cox and others, is that the 1990s were actually better for urban population growth in America than the 2000s in many respects. The poster child for this phenomenon was Chicago, where a fairly expansive area in the greater core showed large population growth. Areas that were formerly almost all commercial, such as the Loop, added significant residential population, while areas that were nearly derelict like the near South Side have blossomed into thriving upscale neighborhoods. Cities across America have invested enormous sums into downtown redevelopment and major projects in selected districts. The good news: these investments have shown some ability to move the needle in terms of attracting young professionals downtown. The bad news lies with the fact that these developments have been extremely costly, and have not transformed the overall demographic or economic climates of the cities that tried them. This demonstrates the limits of the policies. Those who aren't in the young professional, empty nester, or creative class demographic have rightly figured out that they are no longer the target market of city leadership. No surprise then that many of them have decided to vote with their feet. Given the resulting overall negative swings, cities may want to revisit their strategy of putting all their chips in the downtown redevelopment basket in favor of less glamorous improvements in basic neighborhood safety, services, schools and other critical elements. A handful of elite enclaves and talent hubs may be able to thrive on a “favored demographic quarter” strategy, but for most places there just aren't enough young professionals and artists to go around. * Actual population minus projected population as of 4/1/2010 using a run rate projection based on the 2008-2009 estimated population growth. ** Base is the projected 4/1/2010 population above. Submitted by robert1122 on Wed, 07/31/2013 - 06:17. Submitted by RaymondMAguero on Sat, 05/31/2014 - 01:37. Submitted by MAP on Thu, 04/28/2011 - 17:04. While I think cities are fun, efficient and economical places to live and being able to use mass transit appeals to me (In Baltimore there is one 8 station metro line that's useless and a light rail that doesn't connect anything important) I don't think people will come back unless they are safe. Or until there is the perception that they're safe, but that won't change until the demographics change. Baltimore has had 9 homicides in the past week (was it the heat wave that riled them up?). Do you really think sensible people are going to move back in? Does it matter what the economic situation is when driving 45 miles to work is but a small expense compared to what people pay for safety and peace of mind? Some of the country's worst cities are listed here: Atlanta, St. Louis, Cleveland, Birmingham....have some of the highest crime rates in the country. And while there are some other bad places: Gary, IN, Detroit, Baltimore, D.C., no one really expected them to grow much anyway. Bad crime, bad schools, bad demographics. Submitted by Chris Barnett on Thu, 04/28/2011 - 09:37. Aaron, it is not entirely coincidental that the three growing cities you mention by name (Indy, C'bus, and OKC) all have substantially incorporated suburban areas into their city boundaries. I am most familiar with Indianapolis, and the pattern you show for St. Louis and Chicago also holds here: there's a ring of declining population (including some first-ring 'burbs) around a relatively vibrant core (which is flush with government and private investment). The whole thing is surrounded by growing outer-ring suburbs and edge cities. So really, both the "back to the city" and "suburban growth" narratives are accurate depictions of trends 2000-2010. The three cities you named are geographically and economically positioned to capture a good share of both facets of their metro area growth. The three metros share several key characteristics (eds/meds complex, state government center, low cost of living and housing). Submitted by mobi on Sat, 05/09/2015 - 07:45.